The Hague, Netherlands, one of the finest automobile museums we have ever visited. The DECO LINER 1939 Lincoln Sedan Delivery took three years to build and is the realization of a dream owner Terry Cook of Long Valley, NJ has had since 1999. The unique front-wheel drive chassis was designed by Gary Brown, who owns the firm that did the majority of the construction of the car. Starting with a new DECO RIDES fiberglass Zephyr sedan delivery body, the car and bike was finished for the 2008 summer season in a six month marathon thrash by Gary and Dylan Brown and Robert Winningham of BROWN'S METAL MODS in Indianapolis. 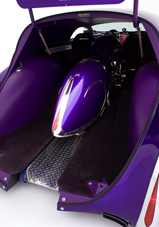 Cook conceived the concept of tucking a '92 Harley Sportster inside the delivery after designing the car's body shape with artist Frank Nicholas of Illinois. It required the use of a front-wheel drive platform to eliminate the rear differential so a minimum height rear floor could be attained to house a 39.5 inch tall motorcycle. Because a low cross member was required for a 9-foot long ramp holding a lowered bike to fit inside, for rear suspension Gary chose a Fat Man Fabrications front suspension setup with Air Ride Technologies air bags. Short tie rods attached to the frame prevent the spindles from steering in the rear. A nine foot long aluminum U-channel ramp, powered by an electric motor that turns an equally long threaded screw, moves in and out of the back of the car at the touch of a switch. The bike is rolled onto the ramp, strapped in position, and the ramp is electrically moved into the car. Several FWD platforms were considered including GM's Eldorado-Toronado-Riviera and Lincoln's 1996-'98 four door Continental. Brown selected the mid 90's Chevy S-10/Blazer or GMC Jimmy/S-15 four-wheel drive, partially because they are plentiful and inexpensive in wrecking yards. The rear half of the S-10 frame, the driveshaft and the 4WD rear was eliminated, the rear of the transfer case sealed off, and the V-6 replaced with a 350 Chevy small block V-8 that bolted right up to the Chevy 700R4 automatic transmission. 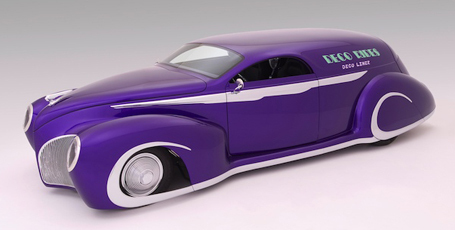 Cook feels this car presents two new concepts to the rodding world. He insists it is not about the bike, it is about the concept of the bike in the car. The second is the decorative metal trim. Actually this is not a new concept as mid-30's Paris coach built cars used ornate metal trim. Flame jobs and other multi-color paint treatments have been done to death, and the concept of chromed metal trim designed to decorate the exterior is a breath of fresh air in an otherwise stale and boring world of street rods, Terry is an admitted junkie of the work of the late Jacques Saouchik and Guiseppi Figoni, and the brightwork on this car reflects their art. 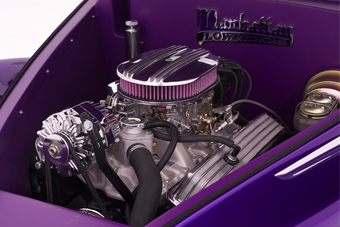 Pro panelbeater Tommy Caruso of CONTOUR METALSHAPING in Plainfield, NJ hammered the majority of the steel that decorates the exterior of the delivery. Cook and Caruso worked together to lay out the designs in masking tape. It was then transferred to chipboard patterns and then to sheets of 19 gauge .040 cold rolled steel. Tommy hand-shaped the contour of each piece. Despite the trim bridging the botttom of the front fender wheel well openings, the tires are able to steer lock to lock. Another metal man involved in the project was Denny Jamison of AUTOMOTIVE HAMMER ART in Gasoline Alley in Indianapolis. 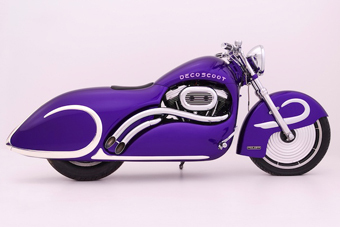 After Juan "Motyme" Rice of Chicago started the '92 Harley Sportster construction, Denny hand-shaped both the streamlined aluminum body for DECO SCOOT as well as the metal trim for the bike and the back door of the delivery. 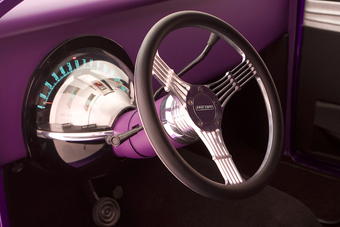 Chrome plating for the trim was done by The FINISHING TOUCH of Chicago. Prior to this project, Cook never realized how much work and artistic talent is involved in achieving a really top quality chrome finish. As is the case with a great paint job, surface preparation is the key to top quality plating. Juan Rice also fabricated the three matching tail light lenses for the car and bike by hand from 2 x 2 x 12 pieces of clear Lucite. STRADER'S AUTO INTERIORS of Greenwood, DE used silver and black naugahyde to do the panels below the beltline. 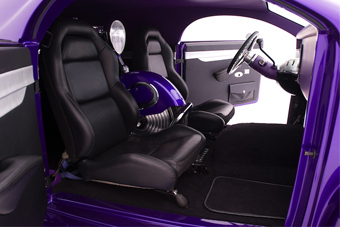 The bucket seats are from a Viper and the front fender of the bike serves as an armrest when the bike is tucked inside the car. Brown used one pair of linear actuators (electric screw jacks) to raise and lower the hood while a second pair operate the rear door. 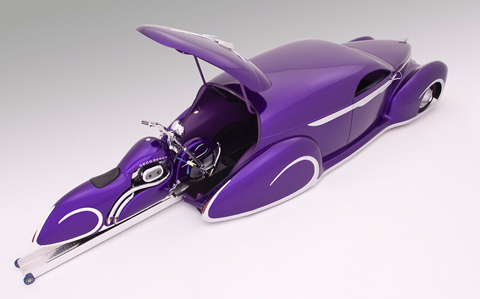 Brown's Metal Mods not only engineered and built the entire car and had a hand in the bike, they also did all the bodywork and paint using RM Carizzma True Violet pearl pearlescent purple. The headliner is painted suede Matte Uno Fed-X purple by RM. 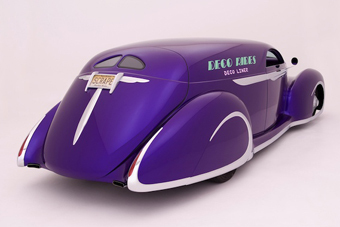 Because the fiberglass DECO RIDES fiberglass sedan delivery body comes with a smooth inner fiberglass liner, the upper rear quarter panels and headliner do not have to be upholstered and can be painted. One nice design feature of the inner body is the streamlined shape of the inner wheel well humps. Another point of interest is the 1960-'62 Chrysler 300 "goldfish bowl" instrument cluster. Because of the 8-inch chopped top, DECO LINER is limited in interior height to a 39.5 inch tall bike sitting on a 9 foot long ramp, DECO RIDES is contemplating building a similar body with a 5 inch taller roof so production Harleys without a windscreen or high bars can fit inside. They are also investigating the use of a Porsche G50 transaxle up front with the gear carton forward of the front axle so a 11.5 foot long ramp can be used to hold a longer motorcycle. The raised roof delivery body with front wheel drive could also allow people in a wheelchair to roll in the back door, secure their chair behind the wheel and drive the car using hand controls. For more information contact www.decorides.com or call 908-876-9100.